In this podcast, CPRE senior researchers Henry May, Abigail Gray, and Philip Sirinides discuss their monumental study of Reading Recovery and how their results could be used to inform and monitor future developments in education. Their paper, “The Impacts of Reading Recovery at Scale: Results From the 4-Year i3 External Evaluation,” was published in Educational Evaluation and Policy Analysis in March 2018. Findings from “one of the most ambitious and well-documented expansions of an instructional program in U.S. history” show the $55 million Investing in Innovation (i3) scale-up of Reading Recovery was highly successful. The randomized control trial (RCT) study of immediate impacts in the scale-up schools—among the largest such studies ever conducted—revealed medium to large impacts across all outcome measures. Effect sizes at the end of 12- to 20-weeks of treatment ranged between 0.30 and 0.42 standard deviations. A total of 3,747 teachers were trained, serving 61,992 students in one-to-one lessons. In addition, these Reading Recovery-trained professionals taught 325,458 students in classroom or small-group instruction. In October 2010, the USDE awarded a 5-year, $45.6 million Investing in Innovation (i3) grant to The Ohio State University. An additional $9.1 million required private sector match was also raised to support Reading Recovery training across the United States. All 19 Reading Recovery university training centers in the U.S. partnered in the project. These funds supported year-long Reading Recovery training for teachers. Although all U.S. schools were eligible for the professional development funding provided by the i3 grant, particular priority was given to very low-performing schools, schools in rural areas, and schools with high populations of English language learners. 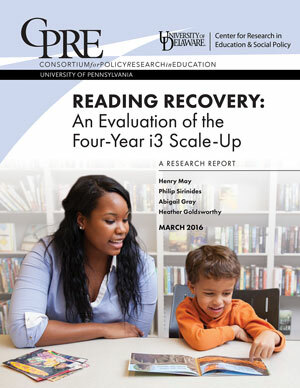 The Consortium for Policy Research in Education (CPRE) was contracted to conduct an independent evaluation of the i3 scale up of Reading Recovery over the course of 5 years. The Consortium for Policy Research in Education (CPRE) brought together experts from major research universities to improve elementary and secondary education by bridging the gap between educational policy and student learning. CPRE’s member institutions are the University of Pennsylvania, Teachers College Columbia University, Harvard University, Stanford University, University of Michigan, University of Wisconsin-Madison and Northwestern University. The report was a collaboration between CPRE and the University of Delaware Center for Research in Education and Social Policy (CRESP). A new ED agency report finds that 49 of the first 67 completed i3 grant evaluations met What Works Clearinghouse (WWC) evidence standards and that 9 of the evaluations — including the Reading Recovery Scale-Up — found evidence of adequate implementation fidelity and positive impacts on student academic outcomes. In addition to consistency with WWC evidence standards, goals set for the evaluations included independence, high-quality implementation measurement, and a sample that adequately represents those served under the grant. Of the four scale-up interventions in the report, only Reading Recovery met both short and long-term goals of i3 and adequately represented the population served. This new report, prepared by the National Center for Education Evaluation and Regional Assistance (NCEE) for the Institute of Education Sciences (IES), summarizes the findings of all i3 grant evaluations completed by May 2017. Get Reading Recovery in your school or district today! We ensure the competencies necessary for a literate and productive future for children learning to read and write.